Aloha and welcome to week 21 of my photo challenge. 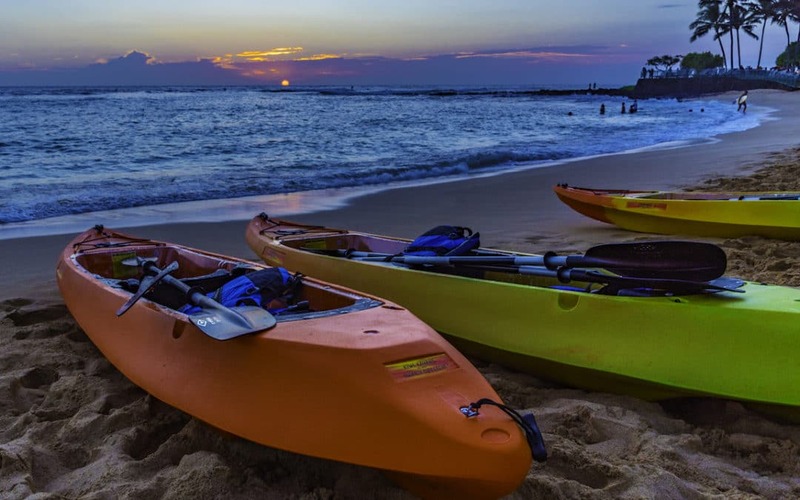 Today I highlight a new business on Kauai – Moonlight Glass Bottom Kayak Tours. I have done some photography for the company, and lead the occasional kayak tour myself. 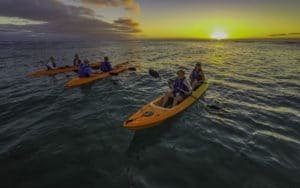 Leaving from Waiohai in Poipu, the kayaks set out at sunset to look for the creatures in the ocean who are active at night. 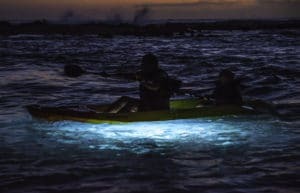 Each two-man kayak has a glass bottom with LED lights which illuminate the sea floor, showing any activity. We have encountered several types of fish, turtles, eels, octopi, brittle stars, and urchins. Last night we had a surprising encounter with a monk seal who came to check out our lights as we paddled around the bay; his appearance was too quick to capture a picture, but he did give us all quite a heart-pumping thrill. Everyone jokes about seeing the “big things” in the ocean at night, but no one is ever entirely prepared. The challenge I had with these photos was taking them in the dark, with the kayaks too far away for a flash to be useful. I wanted to capture the bright LED lights but still have some detail of the paddlers. I am still working on the perfect night picture. Once the boats came a bit closer to shore it became much easier to get a good photo, but the LED brightness wasn’t as dramatic. Either way, it’s a fun project that I will continue to work on until I find the perfect settings, and take my gear out into the water in my own kayak. If you live on Kauai, check out the website and maybe join me on a nighttime adventure in the ocean. Check out Week 20 of my challenge.